An expert field recording requires more than just a good weather-resistant microphone. One needs a feel for one’s subject matter, a discriminating ear, and the ability to make sound so powerful that it makes up for the lack of sight. The best field recordings bring to life specific times and places, serving as travelogues for listeners. In like fashion, an effective soundscape uses field recordings as a base, but manipulates them and/or adds instrumentation to create a fuller piece that often adds up to more than the sum of its parts: a fiction that seems like non-fiction because it captures a greater truth. The artists in this year’s list bring us to other lands; they celebrate the elements of earth, air and water (but sorry, no fire this year); they aurally reflect the passing of time. Our artist of the year in this category is Kate Carr, who is not only represented by her own work (Return to New Caledonia), but by her Flaming Pines label’s brand-new Birds of a Feather series. As both artist and executive, Carr continues to set a high standard for the industry. 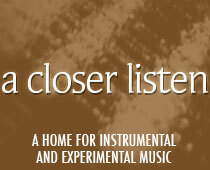 And now, in alphabetical order, we present A Closer Listen’s Top Ten Field Recordings and Soundscapes of 2012.